There is a good reason why Yosemite National Park is the love of photographers like Ansel Adams - it is one of the most beautiful places to visit in the mountains, with endless acres of diversity to explore. 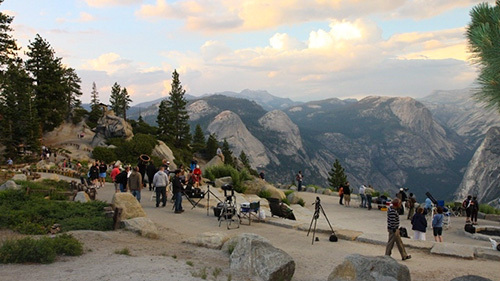 Through a partnership with the National Forest Service, astronomy clubs are able to use Glacier Point, one of the most picturesque lookouts in the park, to educate visitors about astronomy. This event only comes once a year for our club and is well worth the wait. Our club members are typically in the park for two straight nights with a minimum of 8-10 telescopes available for observation. Some members also set up during the daytime (before it gets dark), allowing visitors to view the sun (with proper filtration) and even climbers on Half Dome. Visitors are responsible for the usual park entry fees and must observe specific driving and parking rules on the road leading to Glacier Point. Come join us at this amazing location for observing and learning!